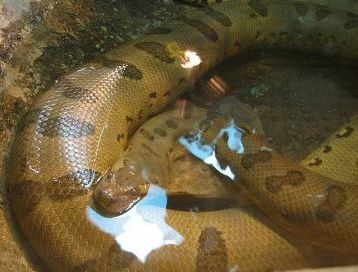 The Green Anaconda is the largest snake in the world. Its scientific name is eunectes murinus. 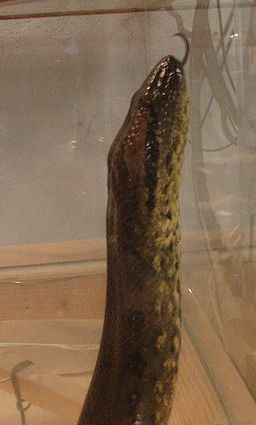 Generally when people use the term Anaconda, they are talking about this snake species. Where do Green Anacondas live? The Green Anaconda lives in South America in the northern part closer to the equator. They can be found in a number of countries including Brazil, Ecuador, Bolivia, Venezuela, and Colombia. They like to live in watery areas as they are good swimmers, but have difficulty moving around on land. These habitats include marshes, swamps, and other areas with slow moving waters within the tropical rainforest. Anacondas are carnivorous and eat other animals. They will eat most anything they can catch. This includes small mammals, reptiles, birds, and fish. Large anacondas can take down and eat fairly large animals like deer, wild pigs, jaguars, and capybara. Anacondas are constrictors. This means that they kill their food by squeezing it to death with the coils of their powerful bodies. Once the animal is dead, they swallow it whole. They can do this because they have special ligaments in the jaws allowing them to open extremely wide. After eating a particularly large meal, they will not need to eat for weeks. These snakes are primarily nocturnal, meaning they are active at night and sleep during the day. They hunt at night, swimming in the water with their eyes and nasal openings just above the water. The rest of their body remains hidden under the water as their eyes and nose is on the top of their heads. This allows them to sneak up on prey. How big do Anacondas get? Anacondas grow to lengths of around 20 to 30 feet long. They can weigh over 500 pounds and their bodies can have a diameter of up to a foot thick. This makes them the largest snake in the world. They are not quite the longest, however, just the most massive. The longest snake is the Reticulated Python. The scales of the Anaconda are olive green to greenish-brown with black spots along the top of the body. Its scientific name, eunectes murinus, means "good swimmer" in Latin. They live for around 10 years in the wild. Babies are around 2 feet long when they are born. Anacondas do not lay eggs, but give birth to live young. There have been no documented cases of an Anaconda eating a human. The main danger to Anacondas comes from humans. Either hunting them or by encroaching on their habitat.